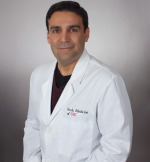 Dr. Pahlevan completed his undergraduate degree in Mechanical Engineering from University of Tehran, his M.S. in Mechanical Engineering from California State University Northridge, and PhD in Bioengineering from California Institute of Technology (Caltech). He completed his postdoctoral training in hemodynamics and cardiovascular magnetic resonance imaging as American Heart Association (AHA) postdoctoral fellow at Caltech and Huntington Medical Research Institutes (HMRI). Dr. Pahlevan joined USC as Assistant Professor of Aerospace and Mechanical Engineering in 2017. In August 2017, he was also appointed as Assistant Professor of Medicine in Division of Cardiovascular Medicine. His is the director of Medical Flow Physics Laboratory (MFPL) at Michelson Center for Convergence Bioscience of USC.